Often times, learning a new game engine can be difficult, especially when it comes to Unreal Engine 4. Unreal Engine 4 makes your 2D and 3D games stand out, as long as you know how to properly use it. This course will teach you exactly how to use it. The 15 lecture course (which only takes an hour and a half of your time) starts off with the basics. It teaches you how to implement the basics to create great visuals that are real to the human mind. From there, you are taught simple, clear concepts. That way it’s easy to follow and Unreal Engine 4 becomes much easier to use. The best part is, you will use the concepts learned for every single game project that you will ever develop. You will even discover and love using the difficult feature, the marketplace. While others (who didn’t take the course) will find that feature hard to maneuver. Apply what you learned to build your own games from start to finish. 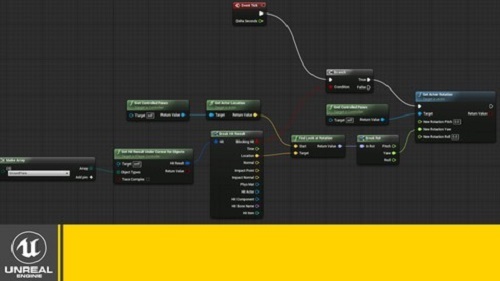 Organize your game development to make your workflow not only quality but faster. Make use of Unreal’s blueprints to expand on first-person shooting and create new characteristics.